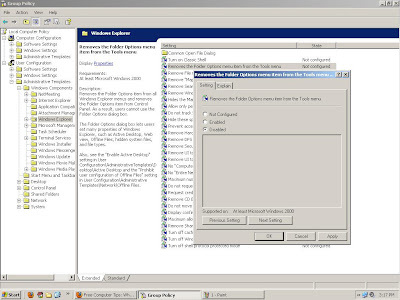 Hello Friends Today I am going to tell how get back the Folder Options .Most of times it happens that viruses infects your system and folder options becomes missing. First of all friends I share one thing with you all that 90 percent of doesn’t delete things on your Computer they just modify their properties like either they hide them or corrupt them. And your information there are several ways to recover from that. Today I am sharing with you “How o fix Folder Options Missing Problem”. 1. Go to the Start Menu and open the run. 2. In the Run Type “gpedit.msc” (Without quotes) and press enter. 3.Now you will see Something like this..
4.Now Go to User Configuration>>>Administrative Templates>>>Windows Component>>>Windows Explorer. 5.Click on Windows Explorer you will find the 3rd option on the right side of screen “Removes the Folder Option menu item from the Tools menu“. 6.Just check it, if it is not configured then change it to enable by double clicking on it and after applying again set it to not configured. 7.I hopes that you will find the option after restarting windows. That’s the Overall Process of fixing the Folder Options Missing Problem…. IF YOU HAVE ANY PROBLEM ASK ME ! Well the steps that are described here only works on Professional edition of Windows XP and Professional, Business and Ultimate editions of Windows Vista and Windows 7. Please suggest that works on Home or Home Premium editions as well.